Here are 20 Must Read Disney World Tips you are going to want to know before you start Disney World Planning. This will save you time, money, and tons of hassle! There are so many things I want to tell you about Disney to make your visit extra magical. This is my catch-all post of tips that apply to all four parks or random suggestions that don’t necessarily fit in any of the other Disney Vacation posts. I hope this is helpful. If you are looking for Mickey, Minnie and Goofy in their traditional clothes make sure to plan some time to stop at the Character Spot in Epcot. Although they did remove Donald and Pluto, it is still a great spot to get three characters while you comfortably wait in the air conditioning with your kids watching Mickey cartoons in the overhead televisions. You can find Pluto and Chip and Dale posing outside in the nearby vicinity. 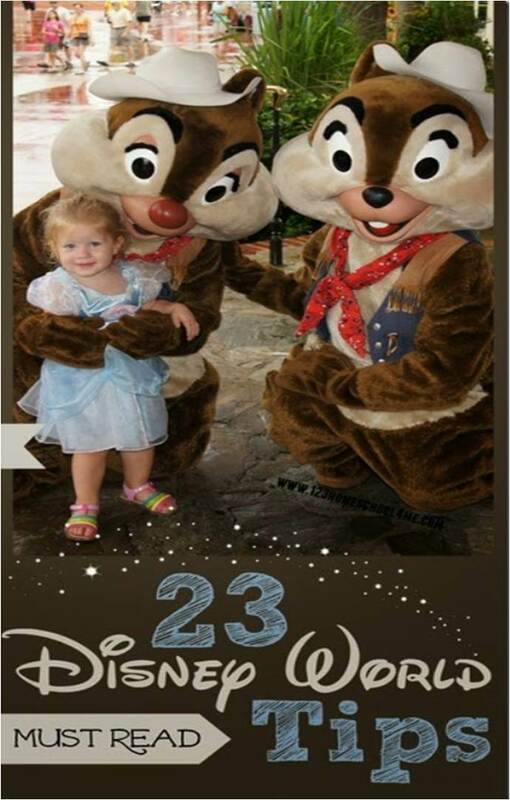 Currently you can meet traditionally clothed Donald in the Animal Kingdom where he poses with Daisy. If all you care about is meeting Mickey Mouse you can visit him at Town Square Theatre in the Magic Kingdom. Plus, this wait is indoor, in the air conditioning, with Mickey Mouse cartoons playing as you wait! Best wait at Disney World! Note: Waits here can often exceed 45 minutes so you may want to use a Fastpass+ if this is a priority for your family. 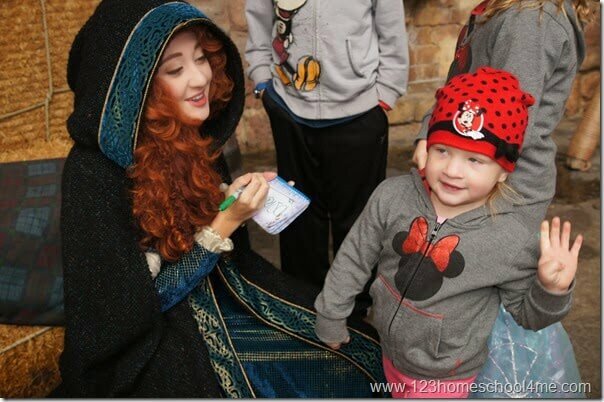 The Best Place to Meet the Princesses? By far the best way to see lots of princesses without waiting in long lines is at the Akershus Character meal in Norway, Epcot. The princesses can vary, but you typically get to meet 5 princesses including Belle, Cinderella, Sleeping Beauty, Snow, White, and Ariel. You won’t have to wait in line, the princesses will come to your table throughout your meal, plus you get to participate with the princesses in a parade, get a FREE picture with Belle added to your Photopass, and you will get to see lots of princesses. This was one of the best character interactions we have! When planning your trip (see 5 Important Tips for Planning your Disney World Vacation) you can go to the calendar page for each park: Magic Kingdom Calendar, Epcot Calendar, Animal Kingdom Calendar, and Hollywood Studios Calendar. You will notice that they may slightly adjust (usually by adding to) the hours as the dates draw nearer. At the Park you will be able to pick up at the entrance and throughout the park a weekly times guide with up-to-date show times. The daily hours will also be listed on a board in your hotel lobby. Disney Trading Pins are a LOT of fun! We like to trade them with employees throughout the park. You will find most employees from street sweepers, executives, and employees who guide the characters around wear pins. Every time they come out they grab new ones. The ‘best’ pins are found 1st thing, but we do not collect them based on which ones are the ‘best’. We each have collections we add to. My hubby collects Villains, I collect pins of rides, Goofy collects pirates, Minnie collects Princesses, and then we all grab ones that look cool to us. I know there are hidden mickey pins, collections, cast exclusive pins, and what- not. Like I said, we collect pins because we like how they look, so I am not really up on which ones are the “good ones” When we get back we put them on a bulletin board upstairs – the kids love looking at their collections! TIP —–> Buy pins in lots on EBAY ahead of time! TIP —–> Don’t wear pins on lanywards. Disney sells pins with lanyards and they do look cook and convenient, but I wouldn’t advise wearing them all. They will get heavy and the backs do fall off and you will loose pins & have very sad children. I think we each lost a pin a day off our lanyards until we decided to just keep a ziplock back with all the reject pins (my hubby kept it in his pocket – you never know when you will see a cast member who has a bin you’d like). When the kids traded we put the ‘good’ ones in either a separate zip lock in our pocket or in the backpack. 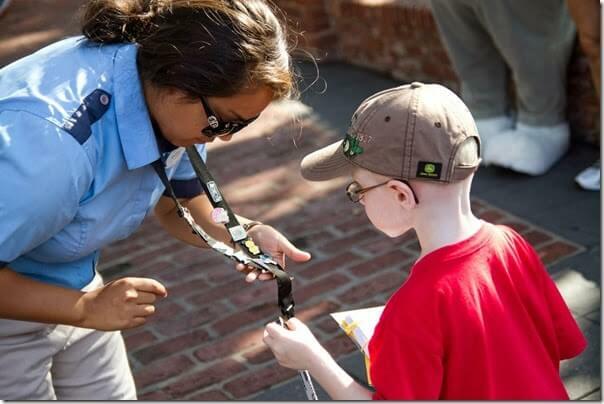 You will notice many kids have autograph books with them at Disney. This is not only a really fun free souvenir, but it helps kids engage with the characters they want to meat. Note: There are a few characters like Sulley & Mike that don’t sign their name. I love using the click sharpie markers – they seem to be fat enough for the characters to hold well & no cap to mess around with! Leave a blank space next to the autograph page for you to glue/tape a picture of your child with the character when you get home – it makes the keepsake even more memorable! Keep your autograph book with you at all times! You never know where a character might pop up!! TRUST ME! Most kids LOVE seeing characters, but it can be time consuming and tiring to chase all over the park after a particular character. 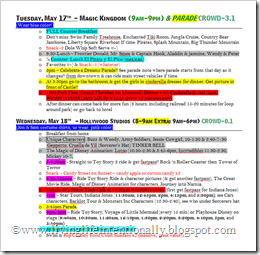 I’ve listed the best places to see mickey & friends and the princesses above. In my individual park guides you will find which characters you will typically find there. But remember characters do change or get sick. If you are looking for a specific character stop by information and ask to find out. Characters take breaks every 15 minutes or so (it gets HOT in the costumes!) They will come back very quickly so stay in line… just be patient. If you see a character with a short line –go see them; I doubt the line will stay short for very long! To have the most memorable interaction with characters, help your child think of a something they want to ask or say them before they get to the front. You might ask Aladdin where Abu is, make crocodile motions with Captain Hook, or ask them what their favorite ride is. Note: Characters who where masks do not talk. You are allowed to bring food in the park with you. I highly recommend a water bottle to keep well hydrated and a granola bar from home– a hungry kid is a cranky kid!! Plus it makes the wait for parades bearable! Make Reservations for Dinning 180 days before your visit as they fill up QUICKLY! I can’t stress this enough. 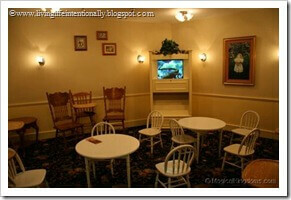 Popular locations like Chef Mickeys will completely book up by 150 days out! 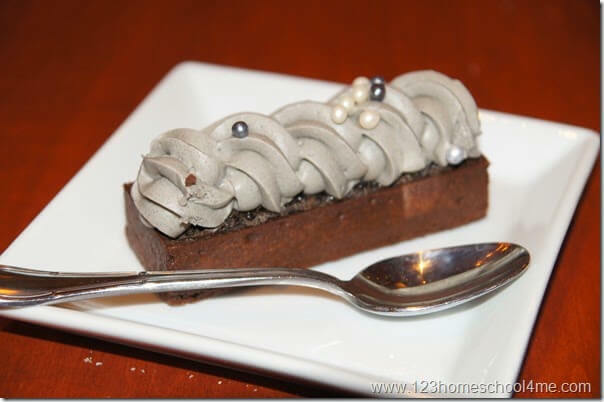 Disney’s Be Our Guest Restaurant is a Don’t Miss! 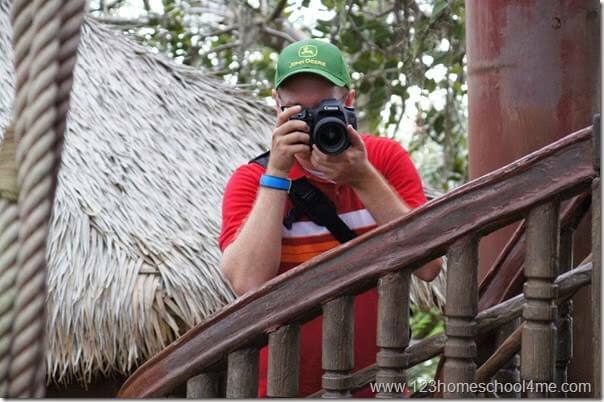 Pictures are one of the most precious keepsake of your trip! I recommend keeping a camera with you at all times to capture those special moments and expressions on rides, seeing shows, interacting with characters, and just silly family moments. Change your memory card several times during your trip and leave the partially full ones in your room safe – just in case it gets wet, damaged, or stolen you will not be out all of your pictures. Don’t just depend on the Memory Maker Pictures! The Memory Maker (previously known as Photopass) is super handy and you’ll find lots of really special pictures, but there are times it doesn’t work right. On our group family vacation they lost our Animal Kingdom, Hollywood Studios, and Magic Kingdom group pictures. We didn’t take any back-ups and they couldn’t locate our pictures….. they are just gone. The photographer is happy to take a picture using your camera too and then you have a back-up of the ‘big’ pictures. If you are at all interested in buying the Memory Maker, buy it before your trip for $149 instead of $169 it will cost you afterwards. Afraid you won’t like a picture, they will give you your money back if you are not satisfied!! Instead of the included CD, it now includes downloads of your pictures. Although you can purchase a CD for an up-charge. Memory Maker includes EVERY picture from Photopass Photographers at all 4 parks plus some freebies of the characters they throw in there. There is a release on the CD saying you own the rights to those pictures and can print & use in Christmas card, etc. No matter how many pictures you get taken it is the same cost – so get pictures EVERYWHERE you see the tan uniformed employees! Hint: If you are traveling with a group you can all use the same Memory Maker (by linking them)! One of the amazing things Disney has done to make a Disney vacation a good option for families with small kids is the Ride Swap!! Basically, if you want to ride Splash Mountain you need to be 40” tall so two of my kiddos are unable to ride. When you get in line tell the employee that you want a ride swap. Then, when they get off the ride, the other parent & up to two of your children can take the pass and go through the fastpass line – saving you TONS of time. I love that you can take all the kids back in with you so the other parent wont miss any of those special memories with your kids! And in case you were wondering you can save the swap for later that day (sorry it has to be used that same day!). I HIGHLY recommend taking a stroller if you have children 5 and under. Not only is there a lot of walking, but kids can nap in the park and will automatically have a seat for parades and shows. Magic Hours are a GREAT Perk! Although I don’t think it’s necessary, if you did purchase the park hopper option, spend the rest of the day in another park as parks are usually slightly more crowded if they have magic hours that day. On days when we are going to stay late for evening magic hours (up to 2am!) we will go back and all nap midday when it is hot & crowded anyway. We’ve had some of our most magical times at these less crowded evening hours! As dorky as it sounds, print off a plan so you know what parks you are visiting, hours (so you know when to get up), magic hours, reservation numbers (you WILL need this! ), flight plans, etc. It is nice to have it easily accessible. I would make 2 copies (one for your stroller to have on you and an extra in the safe in case you loose the first one!) I also include address labels so that when we send postcards to family we just peel off the label and plop it on! By planning ahead a basic plan of attach I can just follow it on vacation without hardly thinking and focus on the important stuff – playing and making memories WITH my kids! Hint: You can use our FREE park plans for the Magic Kingdom, Epcot, Animal Kingdom, and Hollywood Studios to save valuable planning and park time! Fastpass+ is a FREE service for park guests that replaced the paper Fastpass back in 2014. Basically it allows you to skip the line and wait only minimally for attractions, shows, characters, or parades. For guests staying on property fastpass+ is tied to your magic bands (Everything you Need to Know about Disney Magic Bands). For other guests you will use your park ticket. Fastpass+ must be reserved in advance online (highly recommended) or at kiosks located in each land throughout the Disney World parks. 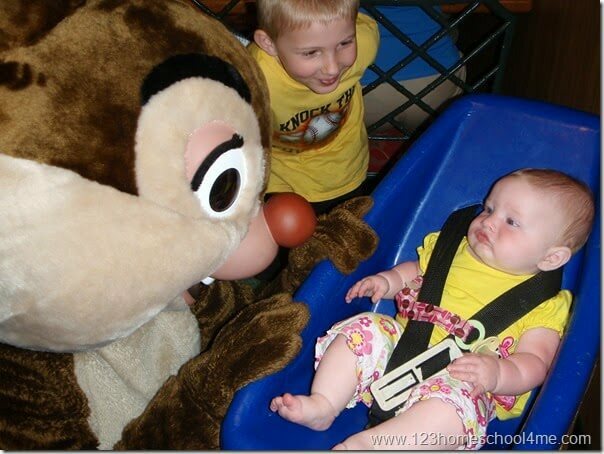 Disney has done a lot to attract families with little children in recent years. You will find playgrounds for kids under 5 who may not be able to ride all the attractions, water areas for kids to play & cool off, and the amazing baby care stations. There is a baby care station at each park. You will find changing tables (with liners), little people toilets, a TV playing Disney cartoons for kids to sit & cool off or wait for little brother or sister, private nursing room with soft lighting and rockers, and very helpful employees who are there to help. You can even buy a diaper if you ran out. Bring These from Home and SAVE! Glow sticks are fun to play with, help families see one another and stay together, and provide kids with a nightlight too. We bring glow sticks from home (see pictures left and right both costing $1.00) and save about $15 over the very cool, but overpriced glow items sold in the park. We did splurge one year to get the bulb necklaces (above middle), but these are reusable and we use them at Christmas time at home too. If we are staying late we all wear the same color glow necklaces to help us better see each other and stay together. Plus my kids think they are pretty cool! If you are staying at least a week consider leaving the park after lunch. After lunch through 3pm or so is the hottest, and most crowded part of the day! So why not zip back to your hotel and either take a rest (Mommy might appreciate a break too!) or take a swim in your hotel pool. Your hotel has a lot of magic to it as well – you might want time to explore it! Plus if you got a refillable mug you can get well hydrated in the process. Again, I might sound a little odd, but I match our clothes. No it’s not just to look good in pictures (although it is striking). The main reason is so we can spot each other easily. If I am going on Big Thunder Mountain with Goofy my hubby can see us on the ride & we can easily spot each other when we are trying to regroup. Plus, heaven forbid, if we got separated we would know what color our child was wearing to tell guest services to be looking for. Another tidbit is to make/order bracelets with your phone number. This is a simple thing to do, but will be a lifesaver if your child got separated from you! There a couple mismatch days (because of costumes or what-not) but here are four of our days – blue, brown, orange, and yellow. What is a Pal Mickey? Disney does not sell Pal Mickey anymore, but they still work. What is it? He is a Mickey with super cool features. When you walk by rides it will shake – if you push him he will tell you an interesting tidbit. Pal Mickey remembers and will not repeat himself on your trip. He also gives tidbits when characters are nearby or s parade or show is beginning soon. This “toy” is super hand & fun to have! You can still find them on ebay…although you may have to work to find a decent price. I got ours for $15, but most of them seemed to go for $75! YIKES!! If you are like most families, you intend on buying souvenirs from your trip. Unless you have a plan you can end up dropping a lot of money on things you probably won’t really care about once you get home. We are pretty thrifty. I think over our two visits we bought a mug for my hubby & I , postcards, and a stuffed animal for each of our kids. Before our vacation we allow the kids to earn money by helping with chores, behaving, using the potty – whatever is age appropriate and a skill you child needs to work on. Then they can earn money to buy what THEY want at Disney. I think we made it possible for them to earn up to $15 (cost of stuffed animal, action toy, or several smaller things). If they don’t earn that much – they have to pick something smaller. It is a good lesson in economics!! Check out these great 32 FREE Disney World Souvenirs. To help our kids understand the time until we go we’ve done several countdown: 10 Disney Countdown Ideas. It is a great way for kids to get excited. There are a lot of Disney movies out there and if you are going to spend your valuable time and money on a Disney World vacation you want your kids to have a context when you get there. Here are the Movies to Watch before a trip to Disney World sorted by park & most important to least! To help younger children know what to expect and to less the chance of music or rides frightening them, I suggest watching the Mickey Disneyland video (they don’t have one for Disney World) and some of the rides on YouTube. We resisted buying Mickey ear hats the first time because they weren’t practical (we are both pretty thrifty) But we decided it is just something everyone should do so we bought them on ebay before the next. SO GLAD WE DID! It was so much fun!! Other than the infant size, all other ones are going to fit everyone. It will fit kids like a hat and adults like a beanie, but it will fit! There is an elastic strap (not noticeable & actually quite comfy) that will hold it on. I would check ebay before you go, Disney World has a limited selection (the current models if you will). You can find TONS of choices on Ebay plus you can usually find several together. I got a princess & a pirate for $5.95 total! I also found a birthday hat for goofy that made him the star of the show at home & in the park. If you’ve never done Disney before (or even if you have) you are going to want to take a peak at this free printable Disney Vacation Packing List. It will help make sure you think of everything you are going to want so nothing will slow your family down from building priceless memories! Plus don’t miss these 5 Things You’ll Want to Bring on a Disney Vacation. If you don’t, you’ll be sorry! And if you are getting to Disney World by airplane, here are 24 Tips for Flying with Kids. Did you know there are 15 Ways to RUIN a trip to Disney World? But don’t worry, they are things you can control or manage. So take a peak and keep them in mind so you don’t ruin the most magical vacation ever!